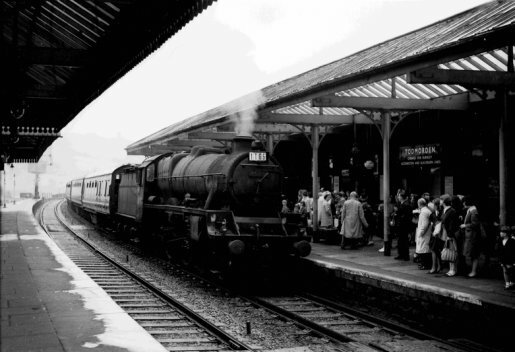 Jubilee 45711 arrives at Todmorden with seaside excursion 1T65 in 1963, 'T' designating a Special Passenger train within division (region). 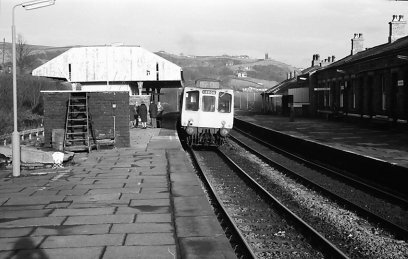 But Todmorden also generated its own excursions. Again in Paul Shackcloth's book 9F 92017 is recorded passing Castleton with 9 empty LMS coaches in June 1960 from Newton Heath to Todmorden, where the train was to be reversed, and then work a half day excursion to Southport via Rochdale and Bolton. 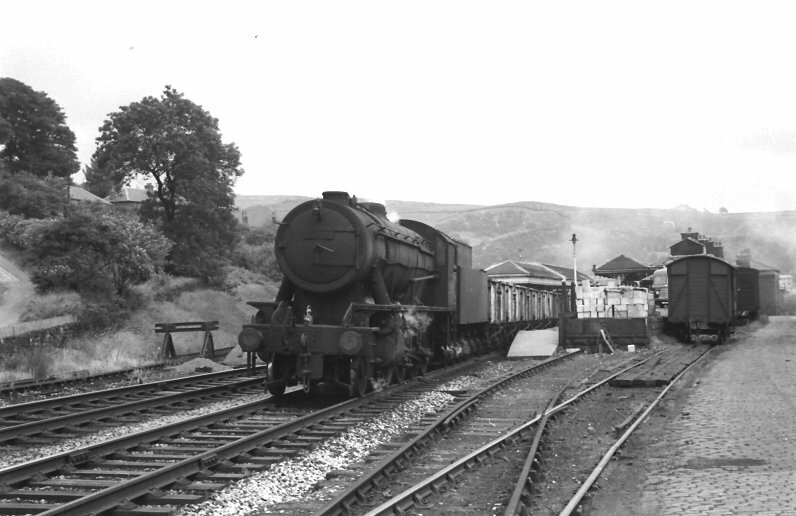 This highlights another unusual aspect of the Todmorden triangle, for the 9F would have backed its train from Stansfield Hall to Hall Royd Junction before using the cross-over in front of the signal box to gain the up Manchester line and so arrive at the appropriate platform to pick-up. This would have seen the loco standing outside Millwood Tunnel (rather than being at the other end of the train, and standing outside the eastern, further tunnel mouth, which would have made reading the ground disc signals difficult, or worse, with the loco actually inside the tunnel). Interestingly, the signal box diagram shows an electronic gong actuated by a plunger in the signal box on the down line in Millwood Tunnel, although the precise use of this in unclear, unless it was to deal with reversing trains which had entered the tunnel 'loco first'. I was originally surprised with the apparent complexity of Hall Royd Junction's signalling, but given this 'full reversal' manoeuvre was a regular occurrence, the track and signalling layout now more sense. And it wasn't just excursions that were reversed this way. The Preston-Burnley-Todmorden trains, latterly hauled by a Fairburn tank, also turned as a complete consist. The rain would arrive from Burnley and stand on the up Manchester. There are then two ways this could be done. It could be reversed to Millwood Tunnel 'right line'. There the loco would again stand outside the tunnel before being signalled across the single slip and onto the Copy Pit line and Stansfield Hall Junction. There it would reverse again round to Todmorden East Junction running 'wrong line' over the viaduct, would be directed across the up Manchester over the single slip and so into the bay platform with the loco chimney first for its climb over Copy Pit. The alternative would be to reverse back round the 'chord' to Stansfield Hall; use the cross-over in front of the box to then run down to Hall Royd, before reversing. This is a less attractive option as it involves the loco standing in the tunnel. 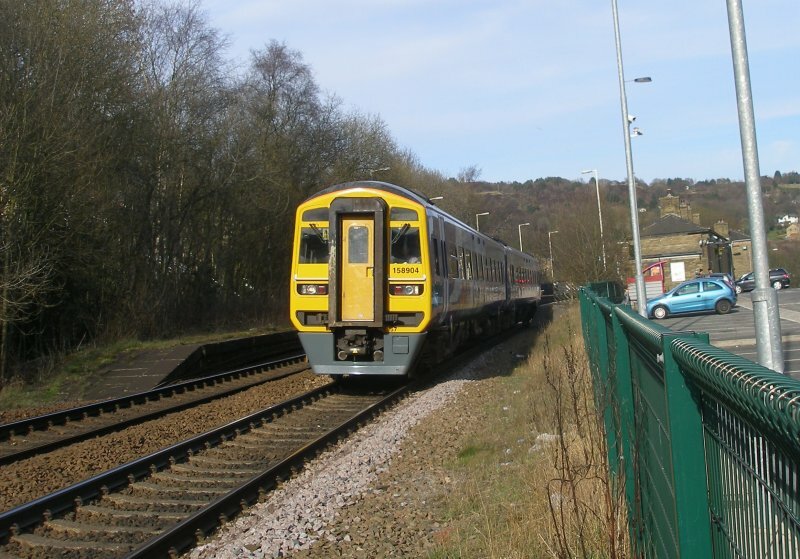 Whichever way it was done, access to the bay platform could only be gained from the down Manchester (Leeds-bound line), so there would be an element of wrong-line running somewhere in the vicinity of Todmorden East box. But it didn't end there, as the loco would now need water. So having avoided any uncoupling in the reversal removal, now the loco was unhitched from the coaches, crossed back over the slip onto the down Manchester, and then reversed into the loop that passed around the back of the island platform to take water from the tower at the end of the down platform, clear of the running line. Having taken water, it would cross back over the two running lines and into the bay platform. 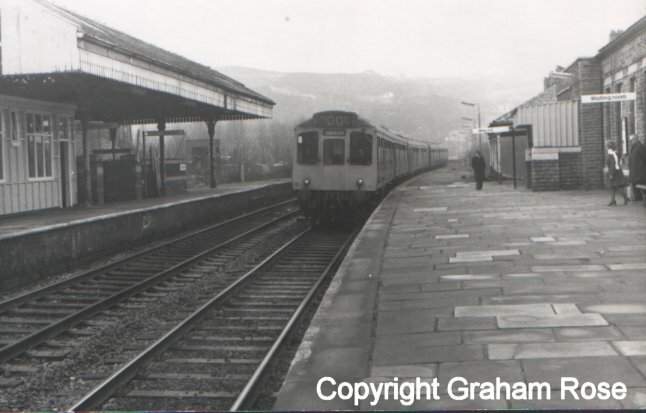 The mid-60s saw the arrival of the diesel multiple units (dmu): Cravens units on the Burnley services and Class 110 Calder Valley units on the Liverpool-Manchester-Bradford-Leeds axis. Class 37s appeared on the Rose Grove freights and then Class 40s. Class 37s over Copy Pit sound a tad light for this duty, even with a bake tender. 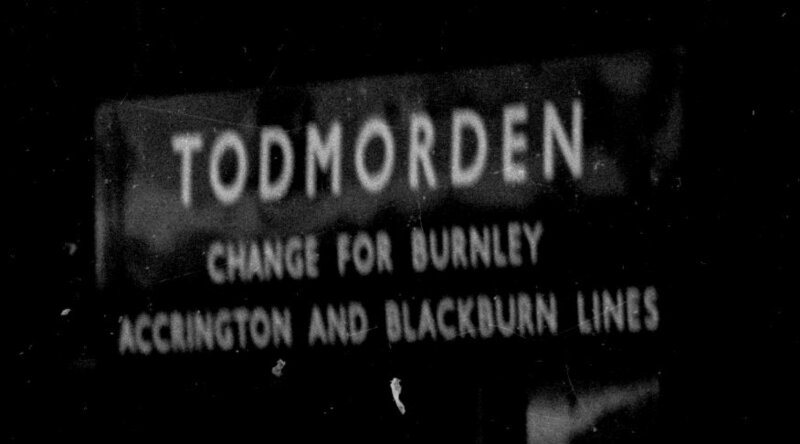 Although not a brake failure as such, there was a tragic accident with a Class 40 which hit the 8F banker returning to Todmorden in 1967. The 8F was dragged to Rose Grove and cut up at the shed. Freight was handled in the goods yard to the west of Todmorden station: the yard was held-up by the Great Wall of Todmorden which marks the boundary with the canal. The sidings to the east, in the triangle formed by the Copy Pit and Manchester lines appear to have been used for engineering trains, particularly the sidings that paralleled the Copy Pit lines. It was here that the wrecked tankers involved in the Summit Tunnel fire were dragged to and then cut up. 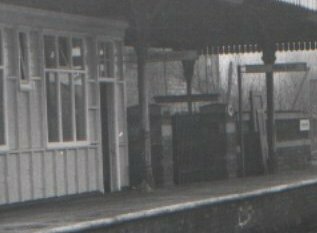 The platform canopies were removed from the station platforms, starting with Platform 1. This view of a Manchester-bound 2 x 3-car Class 110 arriving at Platform 1 on a miserable wet day in the 1980s shows Platform 1 already stripped on its canopy, but the shorter canopy on Platform 2 covering the subway stairs is still in place, as is the wooden waiting room. The blown-up detail shows a section of this rarely photographed structure. The 2013 photograph shows the area as it is now, with the top of the subway staircase now provided with its own dedicated porch, using the original walling. 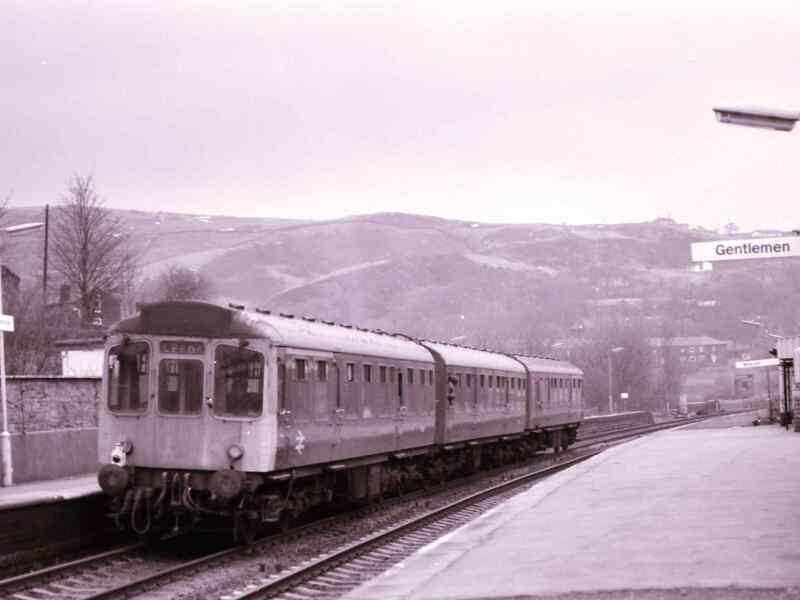 A Class 110 'Calder Valley' stands at the east-bound Platform 2 bound for Leeds. The Station Master's house still stands at the far end of the main station buildings, whilst on Platform 2 the westerly canopy has been removed, but the second, more easterly one which covers the platform exit to the subway, is still standing. The canopy on Platform 1 has already been removed. It will pass over the viaduct and the site of Todmorden East Junction, and then run through Hall Royd Junction before entering Millwood Tunnel. I can remember returning to Southport from Manchester in these units with the luggage racks vibrating in resonance with the engines underneath as the DMU powered across the Lancashire plane in the dark. The Driving Motor Brake is leading, whilst the first class compartment brings up the rear. The yellow line marking the first class can be seen above the windows on the rear car. By now the 4-character headcode has been set to '0000', so denying us the opportunity to identify the actual train and approximate time of day. WD 90116 heads towards Manchester on 23 July 1966 with an unfitted coal haul, taken from off the western end of Todmorden Station Platform 1. Note the location of the buffer stop on the Down loop behind Platform 2 which indicates the loop can no-longer be used as such. Note the stone sets between the siding tracks. These are still evident on the modern path that runs down to Dobroyd crossing. 158.904 departs for Moston on Good Friday 25 March 2016 with 2U34 14:26 Leeds to Moston departing on time at 15:25. There were engineering works closer to Manchester with a rail replacement bus service operating.